Assessment has long been recognized as a key feature in learning efficacy, especially through formative evaluation. 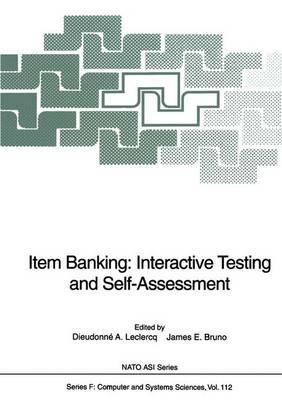 Item banking, the storage and classification of test items, is an essential part of systematic assessment. This volume is based on a NATO Advanced Research Workshop held as part of the Special Programme on Advanced Educational Technology. The workshop brought together scholars from around the world to discuss and critically analyze the issues and problems associated with Subjective Probability Measurement (SPM) or the more generic research area called self-assessment. Recent advances in computer technology (expert systems, interactive video disks, and hypermedia) along with the developing sophistication of self-assessment scoring systems based on SPM made this conference particularly important and timely. The book is divided into three main parts: - The input: item banking and hypermedia - The process: subjective probabilities - The output: teaching and learning feedbacks. In summary, although SPM is a difficult theoretical concept for most educators to comprehend, the sophisticated nature of modern computer systems coupled with comprehensive formative and summative evaluation and self-assessment systems make SPM transparent to the user.